Nottingham Forest v Sheffield Wednesday: What time is kick-off, is it on TV and what are the odds? Sheffield Wednesday will travel to Nottingham Forest’s City Ground for their midweek Championship clash on 19 September. 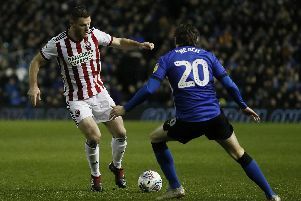 The summer transfer window saw contrasting fortunes between the two clubs as Forest strengthened with 16 new signings, while Wednesday were forced to leave it late until loan deadline day to bring in two new players because of an embargo. Kick off at the City Ground is at 7.45pm on Wednesday 19 September. The match is being shown on Sky Sports Football on the red button and should also be available to watch via the iFollow service. How can I follow Wednesday v Forest live? Defensive duo Daniel Pudil and Joost van Aken may be in contention to make an appearance if they can return from injury in time. Wednesday wait to hear on the fitness of Kieran Lee after he made a short cameo appearance along with Gary Hooper in a match for the Owls under-23s last week. Almen Abdi is unlikely to return to match fitness in time for the clash. Forest’s Sam Byram, on loan from West Ham, is an injury doubt after sustaining a knee problem against Newcastle in the EFL Cup. Tony Harrington will oversee the match along with assistants Paul Hodskinson and Daniel Leach. The fourth official will be Andrew Madley. Sky Bet have a win for the home side at 4/5, a draw at 5/2 and a win for Wednesday at 7/2. What is the form of Wednesday and Forest? The Owls are riding high and come into the fixture on an unbeaten run or four matches and are currently 9th in the table. Forest haven’t got off to quite as quick a start as expected and are currently 15th in the table with just one win in seven games so far. With so many new signings it could be a case of waiting for the team to gel – they saw off Premier League Newcastle in the EFL Cup but have struggled to put games to bed with five draws so far this campaign.